Television Lady: Harry, Harry, quite contrary. I loved these books, and mostly, I love the films, too. But this one left me a bit. . . bored for a lot of it. However. Ginny's voice seriously annoys me. It made me want to fast-forward through all of her scenes, and she's really quite pretty and a decent enough character, I suppose. But if I learned anything from Julie and Julia, it was that an unattractive voice (Amy Adams and that goddamned BUTTER! Ugh.) can literally kill any production, and Ginny was heading that way quickly. Harry seemed very marginalized in this one. Maybe he always was and I'm just now noticing it? Boo. Tom Riddle was extremely well played by both actors Hero Fiennes-Tiffin, who is nephew to Ralphe Fiennes, and Frank Dillane. Creepy, very creepy. Something my friend Donald said to me months ago kind of stuck out this time around, that there aren't really any rules to any of this. Sure, there's a Ministry of Magic, and they seem to be up on which underage wizards are effing around out in the Muggle world, but now that I think of it, yeah, more rules would be good. For instance: Okay, so Bella and the Werewolf Death Eater burn The Burrow? So does that mean it stays burned forever and the Weasleys have to move? Or do they just "reparo" it and everything's back to normal? Because Molly looked very upset and sad about the house being on fire, and if a little wave of the wand was all that was needed, what's the big deal? Thanks for torching my house you bastards, now eff off while I spend a lot of time and effort doing this very complicated incantation? And then wave my wand to create a delicious meal? And while we're at it, how are they always so poor? Can't they just, you know, figure out a way to duplicate school supplies, robes, other things like that? And did they really mean to have that many kids? What of birth control in the wizard world, they've gotta be up on that, right? Or Malfoy and that vanishing cabinet. Or Snape's special curse, Sectum-Sempra? How does one create a curse, exactly? And how is it governed once it exists? And what's with Hagrid and Slughorn and all the boozing, with students? Is that a wizard thing or a Brit thing? 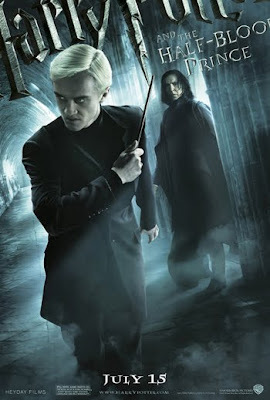 I'll say again that Malfoy crying, especially as the Death Eaters all leave Hogwarts, was well done. Sometimes I seem to like Malfoy more than Harry. And this of course has NOTHING to do with the fantasies of his old man, Lucius, either. Perhaps his being at Azkaban was the reason for my feeling empty. . .
at least there were no House Elves. . .
"there aren't really any rules to any of this." I'm not certain I ever thought about it like that before, but internally, I think this has always bothered me, too. I mean, didn't they even time travel in one of the movies? I actually liked the way it was used in the film, but it does open up a can of worms. I've never read the books, so I have no idea if they're more consistent about the limitations of magic, but I agree that the films, in any case, can be frustrating. You want to see some lines in the sand, like, "You can do this with magic, but you can't do this." blame donald. i was blissfully ignorant and mostly accepted being spoon fed everything that happened because it was interesting, and skillfully done (from azkaban on in the films); books were all well-written in my opinion. but once he pointed it out, i started getting a little uppity. in the books, maybe the last one, they go into what can't be "created" by magic because they're all starving to death in the woods. that's all i remember about it. and in the 3rd book there was a bit on registering animaguses but that sirus black and harry's dad and peter pettigrew elected NOT to register. and one time Harry uses magic outside of Hogwarts, he's immediately expelled, but another time he's personally escorted to a room at the leaky cauldron? Right, well I know that Donald--like me--grew up on science fiction, so we're used to very ordered fictional universes. The "it's magic, so it doesn't need to be explained" rationale is a difficult pill for us to swallow. Even in comic books, for example, in which we're asked to accept all sorts of fantastical assertions, we still sort of understand when the writers are going too far, because the "rules", such as they are, are implied even if they're never explicitly stated. So you might have a character like Doctor Strange, who is meant to be the most powerful sorcerer on Earth, yet his repertoire of spells is based in some sort of logic, and it's understood where his magic comes from and consequently, what his limitations are.